Okay you guys. It’s really hard to hide my enthusiasm; yesterday was one of the most amazing, fantastic, wonderful days to happen since we’ve started on Kerrigan. 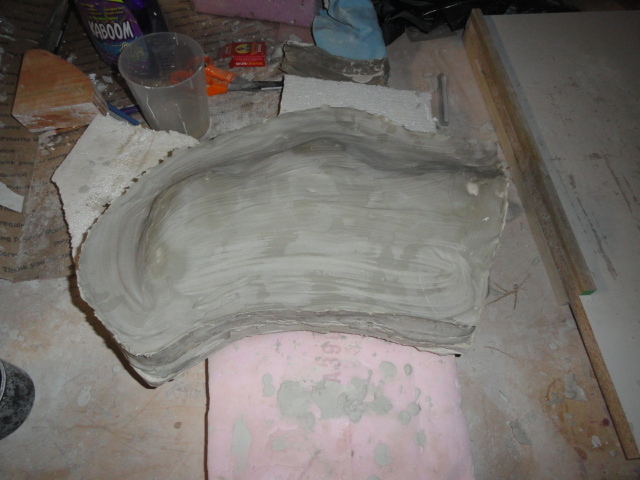 This week, we mostly focused on having the body mold ready to mold with; we filled in some holes, sanded it, and baked it out overnight to get rid of vapors. Here’s our progress for the week! 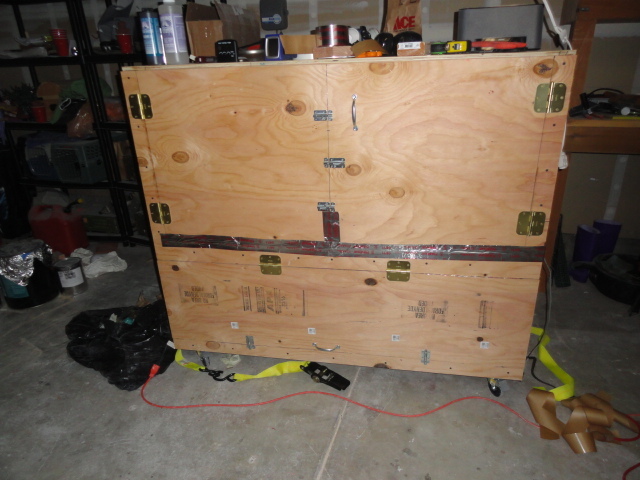 We made a really long trip down to San Francisco to pick up some large 20 quart mixers for making the body suit, since it’s so large. 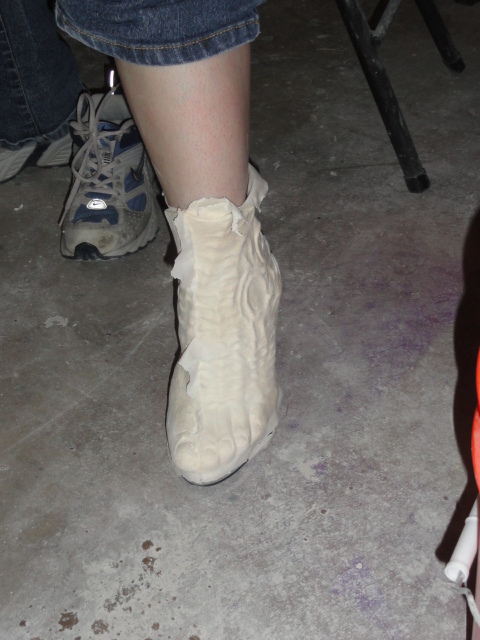 Friday, we also worked on learning how to use foam latex, and I have to say, our first try came out beautiful. 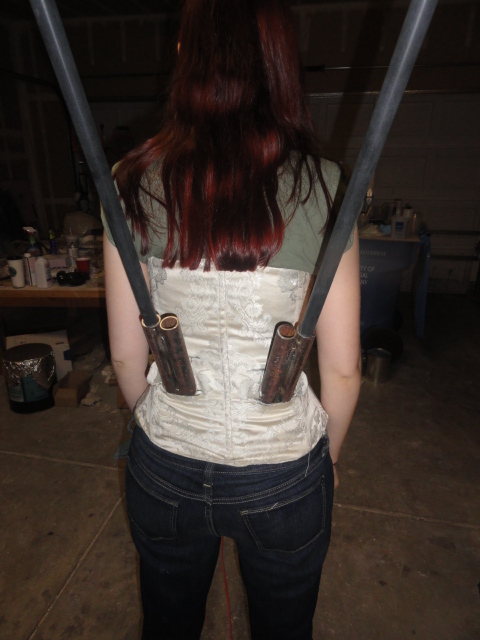 It’s not seamed yet, so still has some extra pieces hanging down, but you get the idea. Looks like a Kerrigan foot to me! 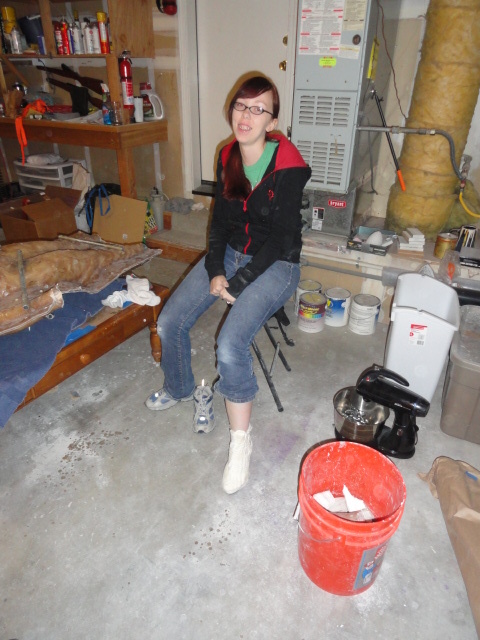 Then Saturday, we had six friends over, who helped us pour and brush the foam latex, and also get the molds together very quickly before it set to the point that we couldn’t use it. It went so smoothly, we’re so happy to have such wonderful, helpful friends! We baked this for nine hours and let it cool for an hour and a half. The detail picked up beautifully, I can’t wait to put it on! We haven’t taken it off the body core yet, because it’s still a bit damp and we want it to dry out first. This has been a busy week for us. We never get as much done as I want to in a week, but something always happens to take up our time (Mario had duty, so he had to work on a Saturday), and I also tend to give us way too many things to get done in a week… but we’re still right on schedule. 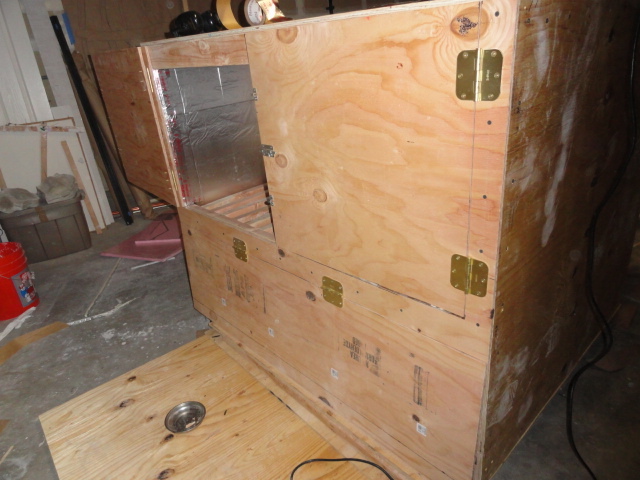 The oven is finished, dimensions are 5 foot wide by 4 foot tall and 4 foot deep. 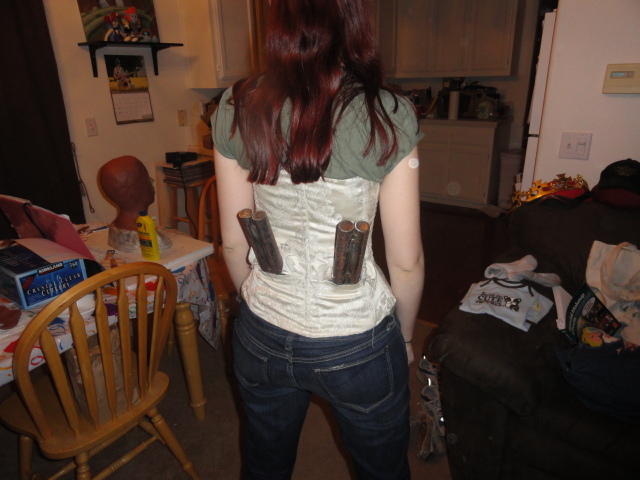 That’s exactly enough to fit the body suit in there. 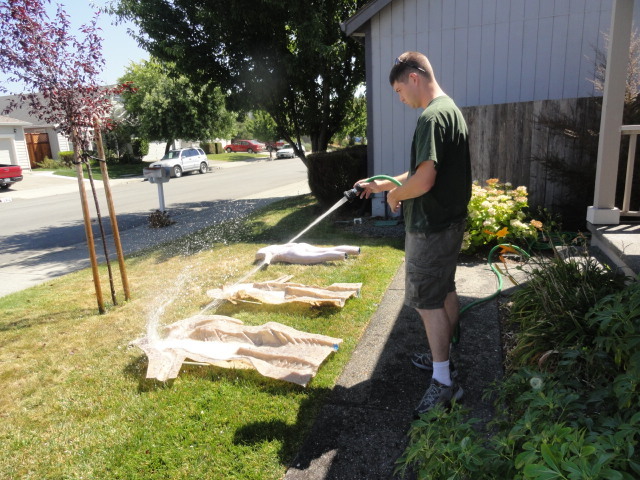 We also cleaned out the body molds (finally…) and dried them really well. 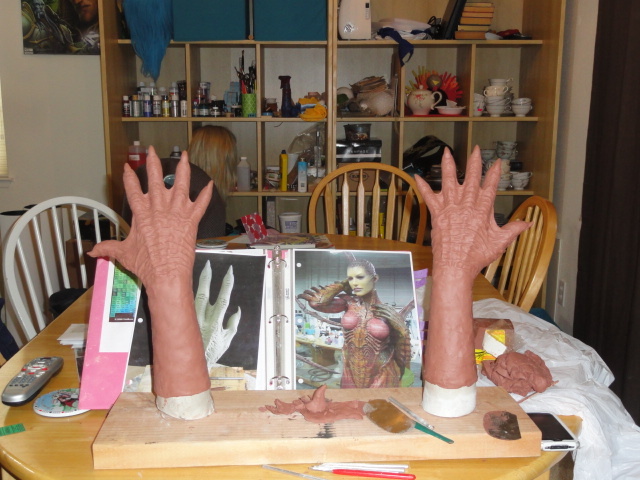 I still need to get a tiny bit of clay out of one of the glove molds, but that shouldn’t take long at all. Here’s the body core that will go inside the body molds… not exactly my size, it’s a bit larger, but we’ll be seaming and cutting down the body suit once we get it baked, and it will fit me perfectly. 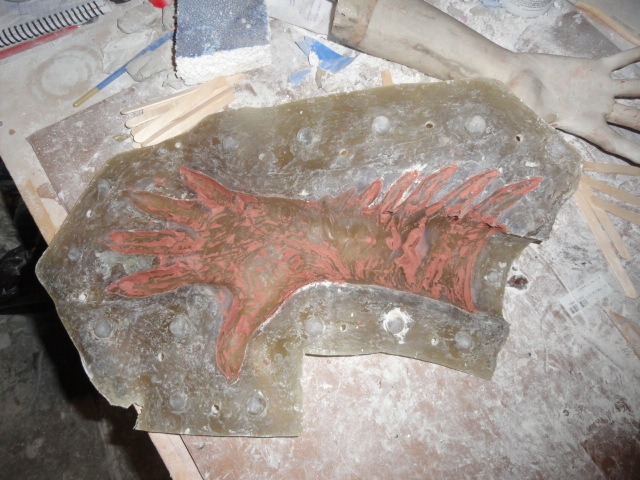 We molded the hands for the gloves, we needed to do this because if we used the stone molds as they are, the gloves would have ripped from us trying to get them off of them, and the fingers would have broken off. 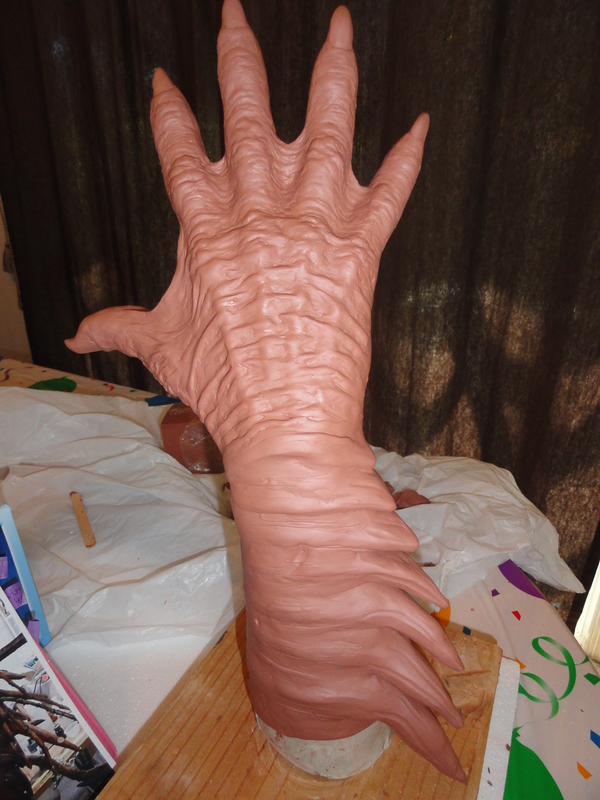 We’re recasting in resin and will be making the thumb and last two fingers detachable to keep from ruining the gloves. Please excuse the messy table, Mario was still working on painting a commission when I took this picture. 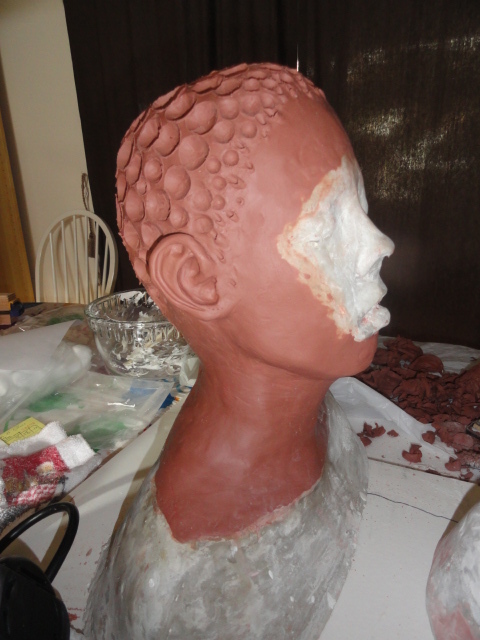 The dreads are all sculpted, we have not had time to mold them yet, but I hope to soon. We also got a ton of stuff in for baking the foam latex, but haven’t taken a picture of it all yet, so you guys can see it next week. 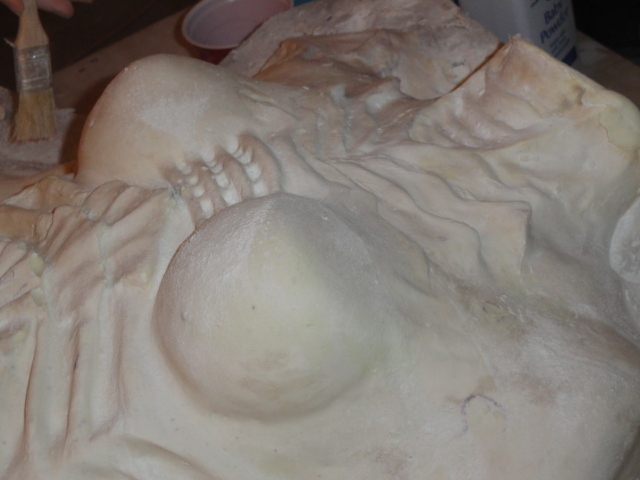 The plan for this next week is to start baking some molds! We’re drying them out right now in the oven, and Thursday or Friday we will be practicing with foam latex, to get the feel of it, then Saturday we’re having a bunch of people over to help us mold the big one- the body suit! I’m so excited to finally be able to put it on! Sorry guys, but not a lot of progress happened this last week. I went back to work so I don’t have as much time to work on things. The oven to bake the foam latex in is almost built, and I’ve been working on the dreads a little bit every day. That’s all there is for this week. 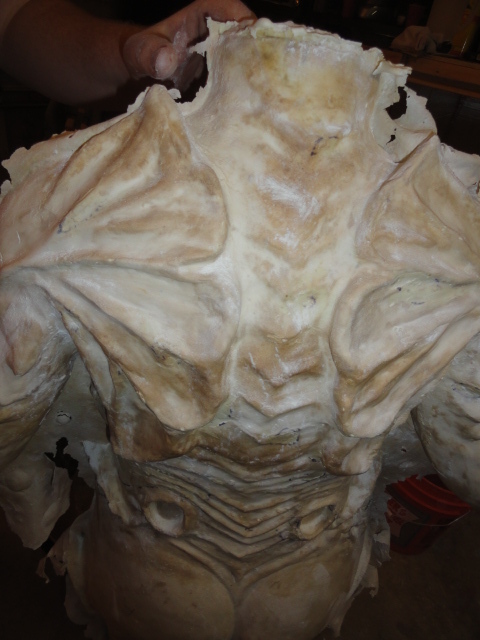 By next week, I hope to have the dreads and cowl molded, as well as some basic structure work done on the wings. These are just the two largest dreads, still need a big of sculpting and texturing, but the basic shape is done. Oh, and we also got in our big order of foam latex, paint, and adhesives for the costume. It’s our biggest and most expensive order yet, so I was pretty excited to get it in today. 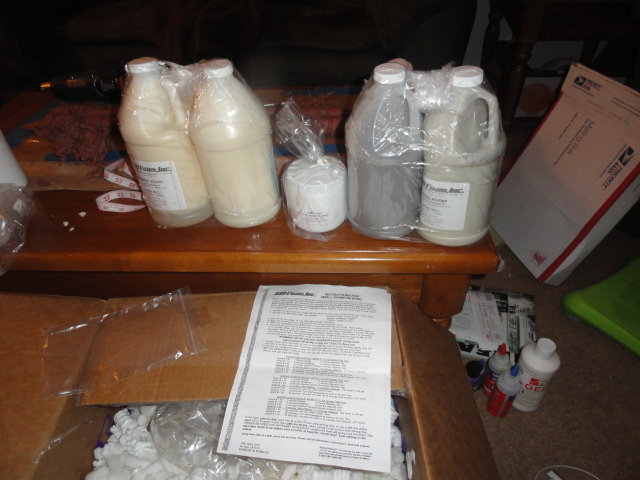 The picture above isn’t all of it, just some of the components for the foam latex. Thanks for reading, I’ll have another update up next week! So.. this past week was just chock full of progress. We got the foot molds open (apparently I didn’t take any photos of that, sorry), the hand molds are made and opened (though not cleaned out yet, doing that today! ), and the beginning of the wing structure is finally finished! By next week, we hope to have the dreads sculpted and molded, and the cowl that the dreads will be sculpted on molded, as well as having an oven built, hopefully! There are lots of tutorials on “How to fiberglass” and ” How to create Pepakura” but there these seem to skip the steps between building the Pepakura pattern and laying the fiberglass. 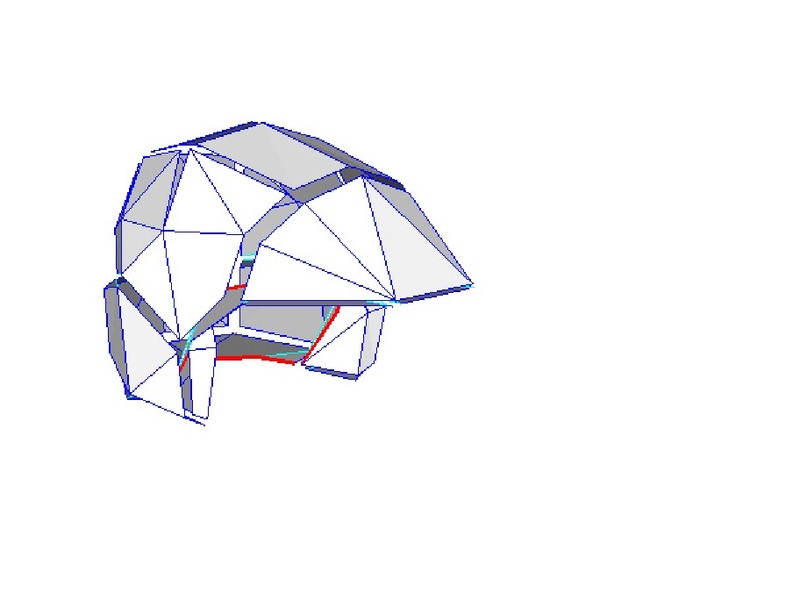 Marine Helm from Halo: Combat Evolved (File from Halo costuming Wiki). Last week was insanely busy for me, between being home a day late from a trip to visit some friends due to airline issues, guests coming over, going to a book signing for George R. R. Martin, and a birthday party, so I didn’t get as much done as I had hoped. We’re still doing pretty darn good though in progress land. 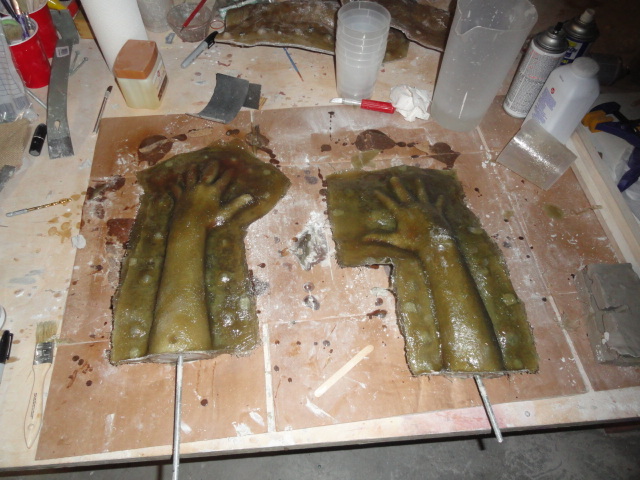 Both foot molds are done… but neither of them are opened. 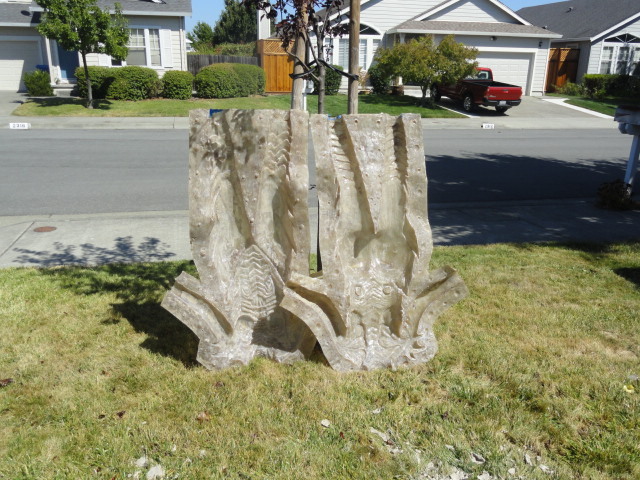 Fingers crossed that these babies decide to open for us, apparently stone molds can be a pain. We’ll be hopefully opening them tonight. We started finally working on the wings. 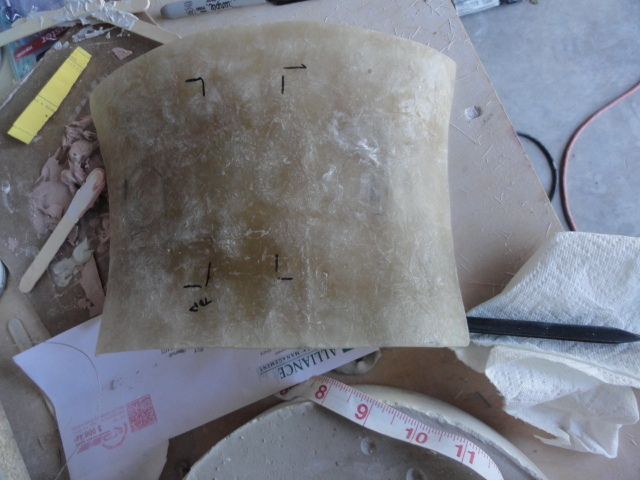 This is a fiberglass back plate that will be going on my back under a corset. 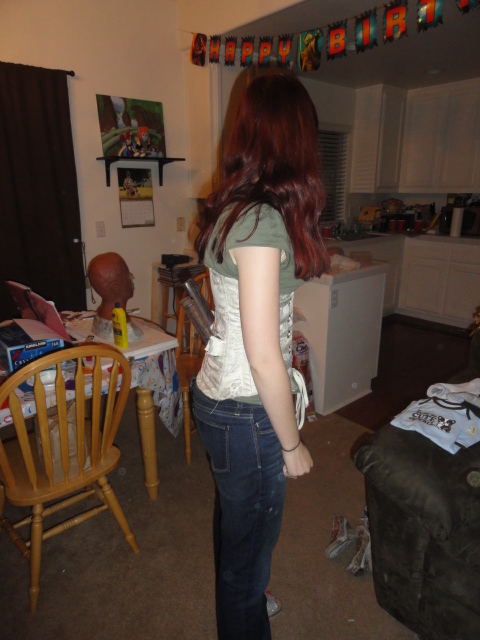 The corset will help support the wings and put all the weight onto my hips, in theory. 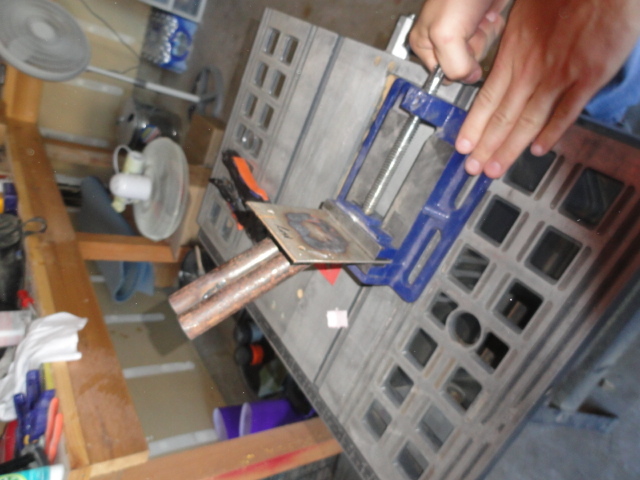 This is just one of the plates that are going to be attached to the fiberglass back plate. Mario worked on bending it with a map gas torch, and we should be attaching them this week. 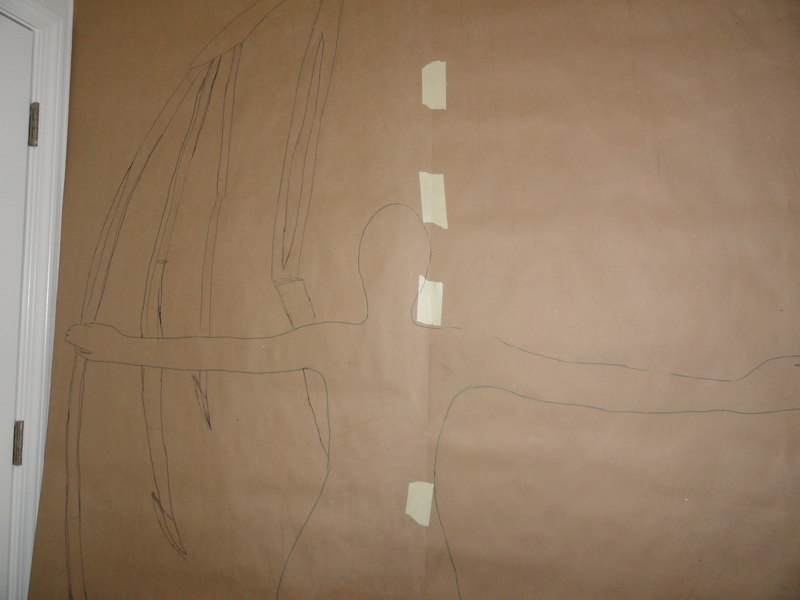 We drew this a long time ago, but this is the scale we’re planning on for the wings. We want me to be able to move around with them, without them being too large to get up the stairs or down the ramp for the costume contest, or being too small to where they don’t make as much of an impact. 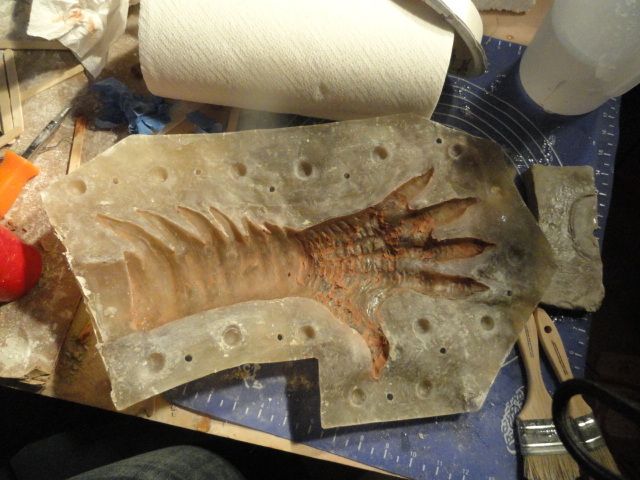 This is what the gloves looked like when I started working on them a few days ago. 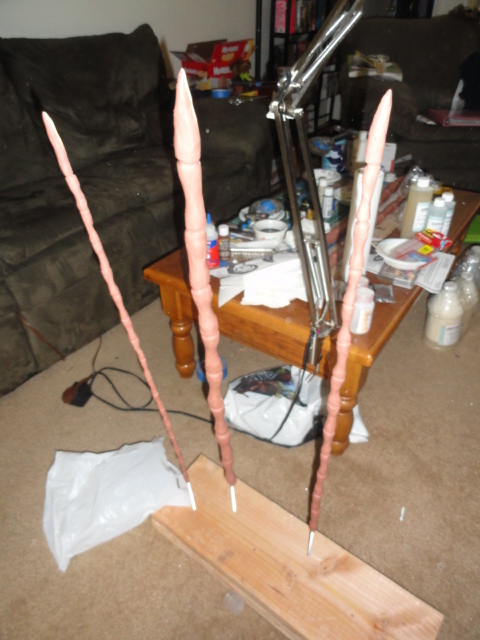 They’ll be finished today, and molded in fiberglass tomorrow. Weird angle so they don’t look quite right, but here is one glove almost finished. That’s it for the progress post for today, next week I hope to have a lot more progress done for you to read about!